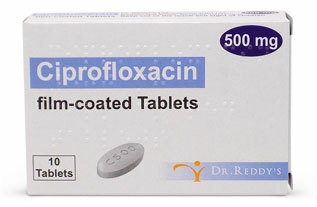 Ciprofloxacin tablets are used for the treatment of a number of bacterial infections. Containing ciprofloxacin as an active ingredient, the tablets can be used to treat travelers’ diarrhoea, as well as other travel illnesses caused by bacteria. Are you allergic to ciprofloxacin? Are you travelling to Europe, North America, or Australasia? Are you travelling to South or South East Asia? Are you taking regular medication from the following list that may interact with Ciprofloxacin? Are you aware that ciprofloxacin may impair skilled tasks such as driving? Are you aware that ciprofloxacin can cause muscle and tendon pain? Are you aware that Ciprofloxacin can increase sensitivity to sun light? Prolonged exposure to full sun is best avoided. Are you aware diarrhoea symptoms should improve within 24 hours of starting ciprofloxacin? Are you aware self-treatment with antibiotics is ONLY suitable for the following people? Please confirm this is for Travellers' Diarrhoea. Ciprofloxacin, also sold as Cipro, is used as a treatment for bacterial infections, most notably for traveller’s diarrhoea. It is a broad spectrum antibiotic which means it is effective at treating various types of bacteria, including salmonella and E.coli bacteria. It works within 1 to 3 days of starting the treatment. Ciprofloxacin should be taken twice a day, every 12 hours, with or without food as directed by your doctor. This medication should be shaken well before pouring each dose and should be carefully measured – do not use a household spoon as this will not provide the correct dosage. Your doctor will determine the correct dosage and length of treatment based on your medical condition. Drink plenty of fluids while using Ciprofloxacin unless your doctor or pharmacist advises otherwise. Ciprofloxacin should be taken at least 2 hours before or 6 hours after taking other products that may bind to it, which will make it less effective. These include vitamins and minerals such as iron or zinc supplements, calcium supplements or antacids, quinapril and sevelamer. Inform your doctor or pharmacist if you have any allergies you are aware of, particularly to other quinolone antibiotics such as norfloxacin, Gemifloxacin, levofloxacin and ofloxacin. This product may contain inactive ingredients which can cause other health problems. Before taking this medication, tell your doctor your previous medical history, in particular that of diabetes, heart problems, joint or tendon problems, kidney or liver disease, mental health disorders (including depression), myasthenia gravis, nerve problems, seizures or conditions which increase the risk of seizures, such as head or brain injuries, brain tumours and cerebral atherosclerosis. Ciprofloxacin may increase the risk of a condition which affects the heart rhythm, known as QT prolongation. This can, in rare cases, cause a serious fast or irregular heartbeat which requires immediate medical attention. How do I buy Ciprofloxacin online? To legally and safely purchase Ciprofloxacin, you need a prescription from a General Medical Council (GMC) registered doctor. Our online service allows you to do this quickly and easily, from the comfort of your own home by submitting a completed consultation form to one of our GMC doctors. Once you’ve chosen your medication and submitted the relevant information, one of our doctors will review the request and, if it is deemed appropriate for you, accepted. Your prescription will then be issues and dispensed by our UK-based pharmacy with full tracking to your chosen address. Medicines are typically dispatched within 24 hours of the order being received. Take ONE twice daily at onset of diarrhoea.